THIS IS A MUST HAVE FOR EVERY CHIMINEA OWNER! KEEP THE HOT EMBERS FROM FLYING OUT THE TOP! This screen goes up the chiminea smoke stack not on top of the chiminea. It will have irregular edges, not a smooth cut edge. We cut it this way on purpose so the irregular edges help hold the screen in place up the smoke stack. Sizes will vary as much as an inch either way so order large as you want this to be tight to install. All chiminea's should have some sort of spark control. What we have here is a screen mesh material made of 304 stainless steel. It has 8 x 8 lines of .028 stainless steel per square inch. This is as good of material I have seen for this type of application. It's the responsible thing to do. Control the sparks and embers that could possibly fly out of your chiminea. In most counties in this country it's the law and if it's not the law now then there's a good chance it will be in the near future. Chiminea's and fire pits have gotten really popular and most counties are putting restrictions on how they are used. This is a good thing. Do you want to be a victim of an irresponsible chiminea owner and have your house burned down? No! Five years ago it would be pretty uncommon to see a family burning a fire in their backyard unless it was in a grill. Especially in the city. The times have changed and a chiminea has almost as common in a backyard as a grill is and in a lot of cases people have done away with the grill and the chiminea or the fire pit is now used as the grill. Keeping control of what flies out of your fire pit or chiminea is being responsible and it's not an expensive investment. It just requires an effort and a little money. Look at your chiminea and look at the smoke stack. Is the stack smaller at the top then the bottom or vice versa. Let's say the stack is indeed smaller at the top (like most all chiminea's) then the bottom. 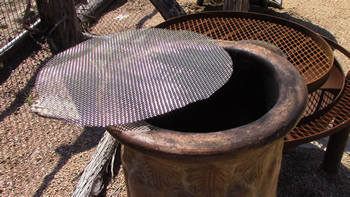 Measure the inside diameter of the stack on the inside of the belly of the chiminea. If it's been used it'll be dirty. Let's say the diameter is 10". Then order a 12" diameter screen. Take the screen and push it as far as you can up into the stack. The further the better. Your done. It's that simple. If the stack is the same diameter all the way thru the stack or if the stack is larger at the top then the bottom then install from the top the same way as above.